Some 10 to 15 million years ago, the Kern River area was a warm, inland sea, making it a perfect environment for breeding algae and collecting organic matter from the land. (Contrary to popular belief, it was mainly primeval algae and plants, not dinosaurs, that contributed the organic matter that later became oil.) About 10 million years ago the sea began to regress, and then about four million years ago the Sierra Nevada range began to be uplifted, giving birth to the Kern River as glaciers carved out the rock and water sluiced off the western slope of the mountains. This makes the Kern River formation a very young one among oil fields. Most of the oil we produce today was formed during extreme warming periods 90 million and 150 million years ago. From time to time, the area would experience huge floods, as water that had been dammed by debris somewhere up in the mountains was released. These floods laid down deposits of sand along the edges of the uplift, burying the undecomposed algae and other organic material. Over geologic time, the accumulated overburden pushed the sedimentary layers down, subjecting the organic matter to the right temperature (200 to 300º F) to cook it down into oil. What remains today is a braided, semi-porous sandstone, containing patchy layers of oil-bearing rock. Seismic studies don’t work very well in such formations, so the reservoir characterization has been done by wireline—literally dropping a sensor down into a hole. Chevron’s slick, interactive 3D model of the field, based on nearly a century of accumulated data, shows nine layers of productivity comprising some 600 total feet of pay zone with about 60% oil saturation. We know from reports of Spanish explorers in the 1500s that Indians gathered oil from natural seeps the formation and used it to seal boats. In the 1850s and 1860s, settlers of the West used it to lubricate their wagon wheels. The first commercially successful oil well in the West was sunk in the formation in 1876, in Pico Canyon some 80 miles to the north of Bakersfield. It was a gusher for its time, producing about 30 barrels per day of light oil, and kicked off the California oil rush. Soon hundreds of leases had been bought, and exploration was under way in earnest. By 1903, over 800 wells had been drilled in the formation, just as other large fields were being discovered in the Southern California area. The first discovery well in the Kern River area was dug by hand in 1899 to a depth of 75 feet, and found a thick, viscous, “heavy oil.” The API gravity of the oil produced today is around 10, meaning it can just barely float in water (in a settled, room temperature sample jar we saw, most of the oil remained stubbornly stuck to the bottom). 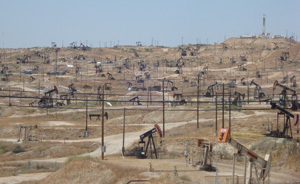 The Kern River Oil Field is now recognized as the fifth largest in the US. It has produced over 2 billion barrels of oil, qualifying it as a “supergiant” field. An estimated half a billion barrels of reserves remain, but with another generation of enhanced oil recovery (EOR) technology, Chevron believes it can extract considerably more. 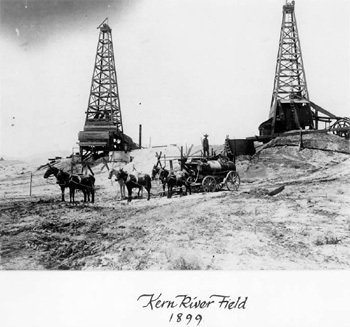 The Kern River field is also one of the longest-lived in the nation, having been in production for over 100 years. The production history of the field is a unique study in the power of technological evolution. Primary production, when the oil came out of the ground under its own pressure, evidenced a typical pattern, reaching a peak quickly and then slowly tailing off for the next five decades. Production had slumped so far by the late 1950s that many expected the field to be abandoned. 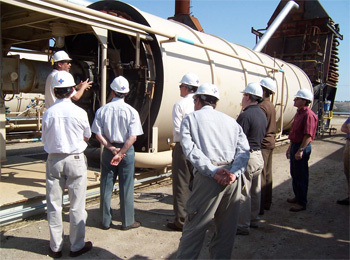 Then came a series of enhanced oil recovery (EOR) measures. Heaters were dropped into the wells starting in 1957, which improved recovery slightly, and in the early 1960s, experiments with hot water and steam injection commenced. The tests were successful, and steamflooding was pursued vigorously starting in 1964. It radically improved the production and over the next three decades, bested the previous peak production rate by a factor of three. The field peaked in 1985 at around 140 kbpd (thousand barrels per day). The long history of EOR technology suggests that the field will show a long tail of production hereafter. After over 100 years of production, it is no surprise that 60% of Kern County’s oil output is produced using EOR methods. 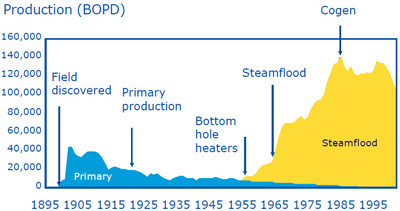 In Chevron’s Kern River project, fully 70% of production owes to steamflooding. The effectiveness of EOR technology when applied to a heavy oil, onshore field in a sandstone formation like Kern River is astonishing, having achieved an estimated 60% recovery factor. (The recovery factor is the percentage of the original oil in place that is technically recoverable.) This compares to an average global recovery factor of 32-35%, and to recovery factors as low as 10% for unconventional oil from sources like tar sands, oil shales, and some deepwater formations. Primary recovery from the Kern River field was only 5-10%. Hot water injection raised it to 15-25%, and steamflooding is thought to be able to achieve 80% recovery. As effective as it is, steamflooding comes with a price. An enormous amount of natural gas, piped mainly from the gas-prone Northern California fields on the western flank of the Sierra Nevada mountains, is required to heat up the steam in huge boilers (at one point, over 200 of them). Seven of the units are gas-fired co-generation plants, generating both steam and electrical power. Consuming 62 million Btu (energy equivalent to about 11 barrels of oil) of gas per hour when in operation, the co-gen plants are able to generate a combined 1,321 MW of electrical power—equivalent to two medium-sized coal power plants. The Kern River oil project only consumes about 550 MW, so the excess power is sold to the grid, or idled as standby capacity for the power utility. But their main purpose is to generate steam for the oil field, and indeed steam generation accounts for the majority of the field’s production expenses. About 180 kbpd of steam are injected into the reservoir today. Additional cold water continuously seeps into the field from the surrounding rock, and what finally comes up into the pumps is essentially oil-stained water. Chevron’s Kern River project now produces about 75 kbpd of oil, and 780 kbpd of water. Indeed, the field more closely resembles a water management project than an oil operation in many respects. Once the liquids are pumped up, they are sent to settling tanks where gravity does most of the work as oil floats to the top. Then more water is separated in tanks containing steam-heated coils. Then it is pumped through a filter of crushed, grain-sized walnut shells, which have an inherent ability to capture oil particles as small as a “firkin”—an amount of oil the size of a grain of salt, distributed in six swimming pools’ worth of water. The water is then sent to a “finishing pond” where it is checked for quality, and finally it is pumped to the water district, where it is used for agriculture. Thus all of the water is recycled, and none is disposed of below the surface. Today, 10% of US oil production and 76% of California’s oil production comes from Kern County. And it takes an incredible amount of technology to do it. The 16 acres of Chevron’s Kern River project looks like a moonscape packed with equipment, including a mind-boggling 15,000 wells. The pumpjacks (also known as “nodding donkeys,” among other names) are spaced as close as 20 feet apart, and the entire zone is packed with pipes, both buried and surface. In this field, drilling a new well is a complex task of figuring out where one can drill without hitting a pipe or a wellbore. Once produced and separated from the water, the oil is sent by pipeline to Chevron’s refineries in Richmond and El Segundo, California. Most of the wells are extremely shallow by oil business standards, ranging from 400 to 900 feet total depth. Horizontal drilling is a fairly new approach in the field, largely because it’s so shallow. Normally one has several hundred vertical feet in which to make a gradual, horizontal turn in the wellbore. Here, it’s more like trying to make straight lengths of drilling rod execute a 90 degree turn at the bottom of a 6” hole in solid rock—an engineering feat, to be sure. One engineer told me he thinks they recently may have drilled the shallowest horizontal well in oil field history. After so many years of production, the average production per well today is a mere 8 bpd, and the median is only 6 bpd. As such, they contribute a significant portion of the 20% of US production that comes from stripper wells (wells that produce 15 barrels per day or less). To manage such a complex network of equipment with minimal overhead, an impressive array of technologies are employed. Sensors on each pump send data wirelessly to a central Well Reliability and Optimization Decision Support Center, where they are monitored by computer systems in real time. For routine maintenance issues, the computers are able to detect a condition, and stop, adjust, and restart the wells automatically, leaving humans to contend with the more complex problems. Additional data is provided by 660 dedicated observation wells that are scattered across the field. About 300 automated test facilities around the field test each well roughly every six days, gathering data on the flow rate and water cut, and sending it to the command center. All of this technology enables just 12 people to monitor all 15,000 wells, which are producing 24 hours a day when in operation. The well surveillance work pays off, reducing the average failure incidence per well from once a year to once every 18 months. As impressive as the oil production technology is, one of the most cutting-edge aspects of the Kern River operation is its experimental photovoltaic project, Brightfield. Built on the site of a former refinery, the eight-acre project boasts a 750 kW array of over 7,700 PV modules including six different makes of thin-film PV, plus one type of traditional crystalline silicon PV, and several different makes of racking systems and inverters. Chevron’s goal is to evaluate the equipment under stressful real-world conditions and see how they perform. Bakersfield is a good site for such testing, receiving temperatures over 100º F in the summer, freezing conditions in the winter, hard rain, large hailstones, high winds, and dust storms. At maximum production, the power generated by the grid-connected array is sufficient to power 40 of the pumpjacks. Chevron intends to use its experience with the project to guide future efforts, potentially expanding its use of solar in the oil field significantly. After seeing the enormous effort it takes to produce oil from the Kern River field here in its twilight years, one wonders what the net energy of the project might be. Unfortunately I was not able to find out exactly how much power is produced on average from the co-generation plants, whose output varies constantly depending on grid demand, or how much of the power is exported, so a crucial factor is missing from the calculation. I did learn, however, that the operation uses, nominally, 300 million standard cubic feet of natural gas per day, the large majority of which is used to create the steam. That works out to 300,000 million Btu per day. Assuming a standard 5.8 million Btu per barrel heating value of the oil (which is likely not the actual heating value of this field’s heavy oil), at 75,000 bpd of output, the produced oil would generate 435,000 million Btu per day. On this basis the net energy ratio (energy output divided by energy input) would be a low 1.45. After taking into account the exported electrical power of the co-gen plants, the ratio would be higher, but not hugely so. If I had to guess, I’d put it in the range of 3, plus or minus, or roughly on par with tar sands production. Can Heavy Oil Cure Peak Oil? The success of heavy oil production methods like Kern River bodes well for future oil supply. Not only does it add length and girth to the long tail of US domestic production, but heavy oil is also on the frontier of the oil business. The enormous resources still locked up in the Athabasca tar sands, Venezuela’s Orinoco formation, the Partitioned Neutral Zone on the Kuwait-Saudi border, and Brazil’s new deepwater fields are among the world’s last significant remaining deposits of potentially viable liquid fuels, and Chevron is working on unlocking all of them using the knowledge it has acquired from Kern River. This does not by any stretch put the lie to the peak oil problem, however. Peak oil means, simply, the maximum production rate, and that rate has remained fixed around 74-75 mbpd for the world since late 2004. As the majority of the world’s mature, high-quality, lighter oil fields continue their inexorable declines, heavy oil projects have managed to largely make up the loss, holding the world’s net output more or less steady (ex-“above-ground factors”). Heavy oil production and ever-evolving EOR technology will no doubt extend the world’s oil production profile, producing a longer and thicker tail. It will not, however, create a new production peak in the future. I still expect the decline of mature fields to finally overwhelm new additions somewhere in the 2012-2013 time frame, and put the world on its inevitable and terminal slide down the back of Hubbert’s Curve. There is also the problem of the net energy. Hall, et al. have shown that if you want to support an advanced society, you need a net energy ratio closer to 10; three doesn’t cut it. Therefore we must view heavy oil production and EOR methods in general as supportive of longer-term societal stability, a marginal safeguard against the economically devastating sharp drops in production that might otherwise occur. We may well yet get such drops, and indeed I believe we will, but they will be due to the complexities of our global economic system, and not directly attributable to simple petroleum geology. Accordingly, I think it’s encouraging that Chevron is exploring solar at this project, along with the many other projects incorporating solar power in which it invests. The day may yet come when Big Oil deems it in their best interest to offer more solar solutions, and their experience with it in the oil fields will contribute to its success. [i] According to the excellent academic paper, “What is the Minimum EROI that a Sustainable Society Must Have?“, Hall, Balogh, and Murphy, 2009. What kind of solar energy future do you envision? I notice you don’t really make explicit reference to photovoltaic cells in your conclusion. Thermoelectric generators? I suppose you see a “cut-off” point somewhere down the road in availability (physically or economically) of fossil fuels to be directed towards photovoltaic production. Don’t know where you’re at on Internet memes but Chris, Y U NO BLOG MORE?! Thank you for the very interesting article. It must have been a great experience being there. I would like to point out that although your net energy calculation could be right, the “net value” calculation for the company works a lot better for them since they have very inexpensive NG BTUs per dollar input whereas their output becomes very expensive Oil BTUs per dollar. This occurs, of course, because of the huge current spread between oil and NG. Once again you have taken the complex and made it accessible. A great read and an informative piece that should be part of the California State history Standards in our high schools. @Ross: I see a bright future for both PV and solar thermal (both for heating and electrical production) technology, as well as passive solar building techniques. And yes, I do expect there to come a time when fossil fuel depletion makes it difficult to build more renewable capacity. I wrote on that in Seven Paths to Our Energy Future, Time to Take the Long View on Energy, and others. I haven’t been blogging because a) I wanted to take a long break after 10 years of writing on the subject, and reconsider my objectives, and b) I needed to focus on work that paid. @Arturo: No doubt the economic return calculation is very different from the energy return calculation. But the former has gotten us into a hell of a fix, and I believe that emphasizing the latter is key to getting out of it. @Chris: Thanks! Glad you found it useful. Making the complex accessible is one of my top objectives.